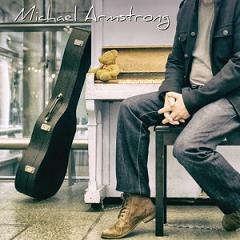 RockUnitedReviews: MICHAEL ARMSTRONG: "Michael Armstrong"
Pay extra attention fans of Soft-Rock and West Coast of the mid/late seventies era. Michael Armstrong and his self-titled debut album will take you on a trip to the days of lushly arrangements with layers of background harmonies. Featuring iconic musicians such as Albert Lee (Emmylou Harris, Eric Clapton) on guitar. Peter Howarth from The Hollies on backing vocals. Guitarist Elliot Randall (Steely Dan) and saxophonist Ed Barker (legend in his own time). Add that this album was produced by Keith Bessey (10cc, Elton John, Cliff Richard, Shirley Bassey, John Wetton, etc.) and you're in for a massive shock treatment and surprise. It's soft rock at its nearly best and you'll constantly be reminded of 70's acts such as Billy Joel, 10CC, Jackson Browne, Wings, Leo Sayer, Elton John, etc. A vintage sound from the exiting new U.K. musician and massive Chelsea fan (Armstrong recorded the popular Chelsea fan song the other year). It's piano rock from a storytellers point of view and Michael's lyrical wit and honesty lift these tunes onto a level rarely heard in the digital era. No worries mate. There's of course the CD release as they did send me a disc. TRUCKER DIABLO: "Rise Above The Noise"
SAGA: "Best of 1978 - Infinity"
The V: "Now Or Never"
DIMINO: "Old Habits Die Hard"
WARREN HAYNES: "Ashes & Dust"
DAGOBA: "Tales Of The Black Dawn"
POSTCARDS FROM JEFF: "Modern Language"